Tags: 480 Yonge, 484 Yonge, clock, condos, construction, downtown, facade, fire hall number 3, redevelopment, St. Charles, tower, urban, Yonge St. 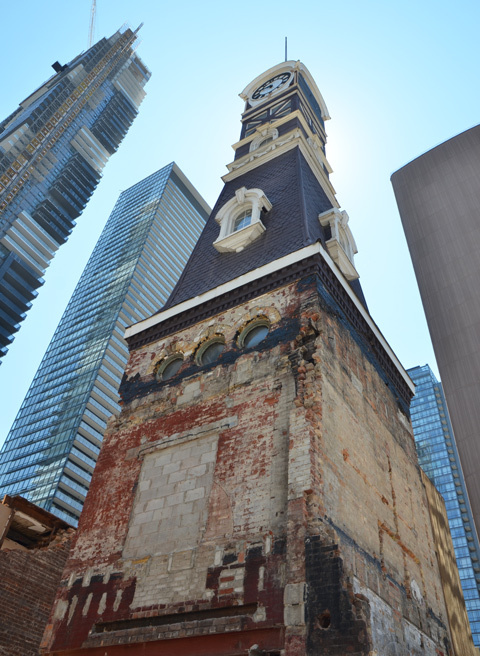 While walking on Yonge Street on the day of the Pride Parade, I noticed that the St. Charles tavern clock tower was visible once more. Also on that day, I heard someone ask the person beside them what the tower was. The answer was something like, “I don’t know what it is but it looks interesting.” I went back this weekend to take some pictures – not quite so many people in the way! below: The St. Charles as it was back in the 1950’s. It was built by Charles Hemstead who had made his money in real estate and horse breeding. Hemstead sold it in 1958 but it continued as the St. Charles until 1987.
photo credit: 1955. Photo by James Salmon, originally found at Toronto Public Library. I found it online at Toronto.com in an excellent article about the history of the building and its role in the LGBQT community. 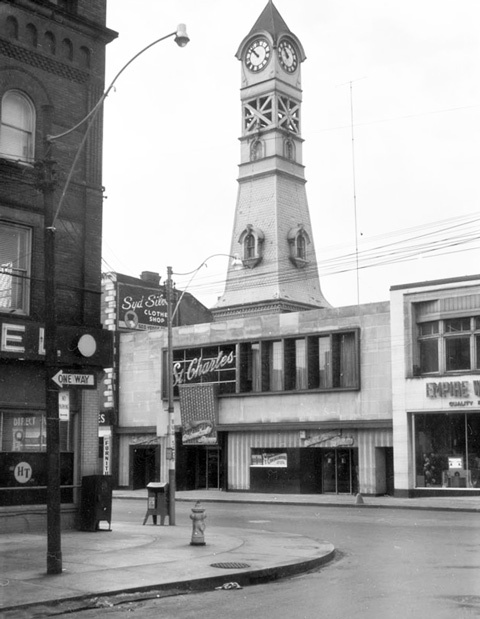 I have always associated the tower with the St. Charles Tavern but I now know that the tower pre-dates the St. Charles by many decades. It was built as part of Fire Hall Number 3 in the 1870s. 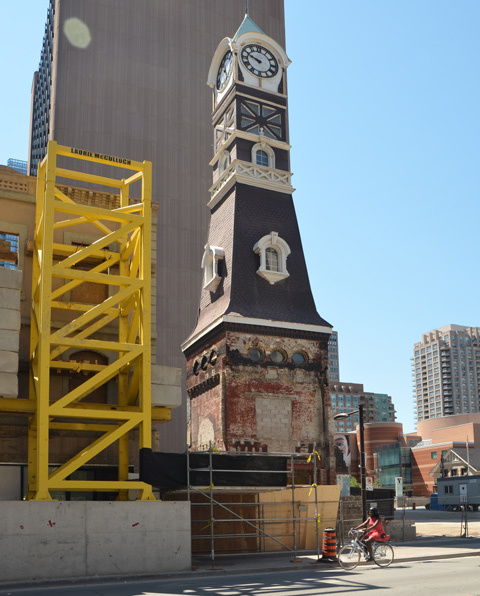 Although the fire hall is long gone (it was replaced by the fire hall on Grosvenor Street in the 1920’s), the clock tower has survived several changes of ownership. It is also going to survive the next change which, of course, is the building of a large glass and steel condo on the southwest corner of Yonge & Grosvenor. below: The site has been cleared. Looking south from Grosvenor. below: Looking north up Yonge Street towards Grosvenor. 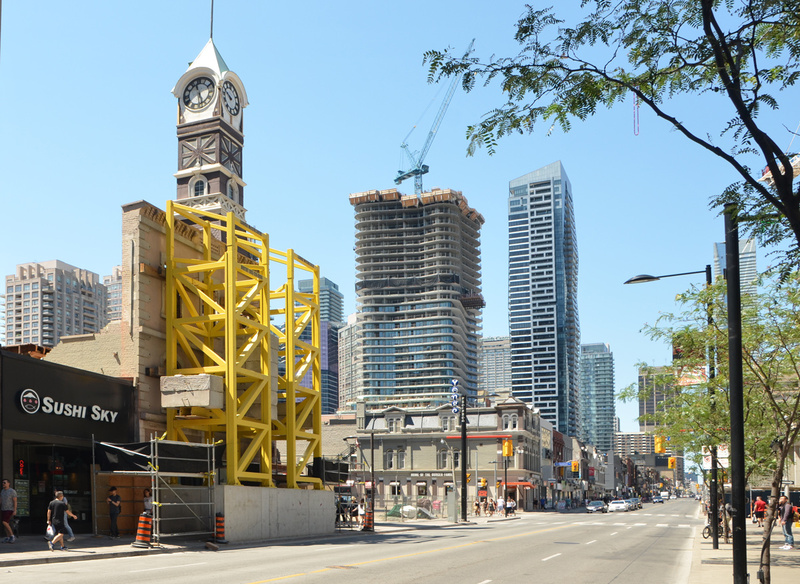 The yellow scaffolding is holding up the brick facade of 480 and 482 Yonge Street. It too will be incorporated into the new development. Can you count how many new condos there are? Did you notice that the two clock faces say different times? The clock kept time until 1969. It had been maintained by the city up until then. Repairs and upkeep stopped when the city decided that the cost was too much. Maybe it will function once again in the near future. 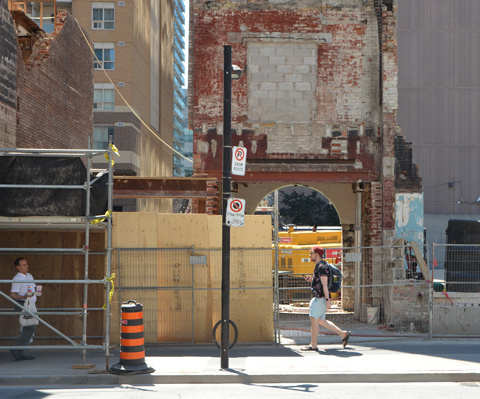 below: An archway has been built into the back of the clock tower. How interesting! I’ve always wondered what it’s history was – just assumed it had been part of a fire station at some point in time. So much construction going on! Glad to see they’re making an attempt to keep some of the original buildings. When I had heard there was a condo development going on here, I feared that the tower was going to be demolished. I was relieved to hear it was going to be incorporated into the new building. I’m curious to see how it will look in the final result. The archway built into the bottom gives a hint that it will part of an entrance.